Chris Hemsworth has got a lot of comedy mileage out of the fact that his character, Thor, was absent from last year’s otherwise superhero-stuffed smash-em-up Captain America: Civil War. There was that hilarious mockumentary which revealed that the God of Thunder was flat-sharing with his unfortunate friend Daryl during the events of the movie, while the actor also posted a fun video of himself insulting both sides of the fight. Now, the Australian Asgardian is at it again, sharing a rib-tickling video (seen above) on his Instragram account, in which he claims that he’s wandered into a “little secret Avengers rehearsal” on the set of the currently shooting Avengers: Infinity War. ‘Little’ is the operative word here, by the way. The video features Hemsworth discovering a table full of Avengers action figures. To the actor’s annoyance, the Russos haven’t invited Thor to the party – just like in Civil War – as there’s no God of Thunder figure to be found. Cue Hemsworth letting his frustration out on the action figures…by smacking them around the room with the aid of Mjolnir. Note to fans: never leave your prized Marvel merchandise in the vicinity of Chris Hemsworth. Unless it’s to do with Thor, of course. On a more serious note, the Russos have also confirmed that today marks day 63 of production on Avengers: Infinity War. 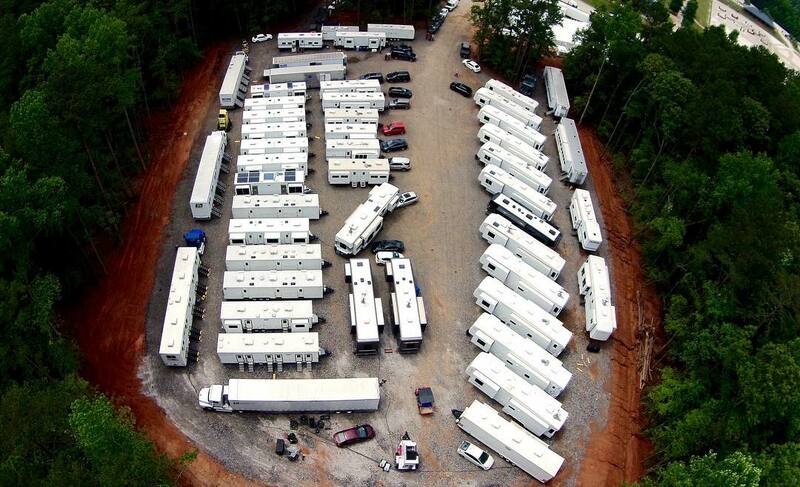 To celebrate, they posted a photo (seen below) of the cast and crew’s trailers on their own Instagram account. You won’t find anything revealing in it, but the pic does give us an idea of just what a massive shoot this is. Avengers: Infinity War – which Hemsworth will definitely be in – is set to arrive in theatres on May 4th, 2018. Before that, however, the God of Thunder will return for his third solo movie in Thor: Ragnarok, coming to Midgard on November 3rd.